So everyone knows you as the resident funny guy, but you seem to have run short on ideas recently in order to introduce laughs into the lives of those whom are close to you. Why not get back to the basics with something that is really nutty? The $35 Hanaga Tap Nose Outlet ought to fit the bill perfectly, as you surprise your household at the end of the day when they return home from work, only to discover a lookalike of a human nose plugged into a power outlet. 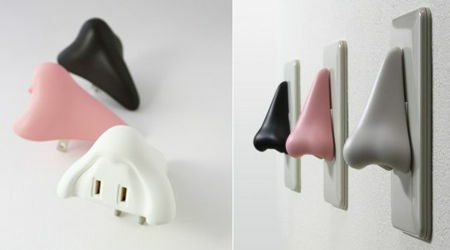 The Hanaga Tap Nose Outlet is a designer electrical plug accessory which has been shaped to resemble that of a human nose, complete with nostrils. At least there will be no boogers to worry about with this eye-catching accessory, where you will be able to select from a trio of colors – white, pink or black. Compatible devices that will be able to play nice with this particular snout would be those which play nice with any two-pronged outlet, where it ought to work just fine as long as the device using has been rated at under 1,500 watts. This is for two pronged outlets only, so those who live in countries with a different power outlet would do well to obtain an adapter plug beforehand. It’s so cool, you might even catch a chill!